As crossword puzzlers across the city quickly brought to our attention when print editions of Creative Loafing hit racks yesterday, we made a big mistake. Somehow in the process of putting the paper together, we included last week's puzzle board with the clues for the this week's puzzle. It quickly became apparent to most that some obviously right answers were not fitting in the puzzle. 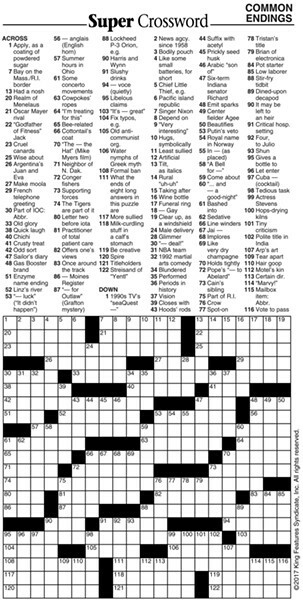 We apologize, and have included here the full, correct puzzle as it was supposed to appear in this week's paper. We've made it big enough to print and enjoy, although we know it's just not the same as a crossword on newsprint. If you just print this page, the puzzle will split on two pages. If you press the image, open it in a new tab and then print, it should come out just fine. I know, so annoying. We'll be sure not to make the same mistake again. Email us at backtalk@clclt.com for the answer key and we'll send it right over.